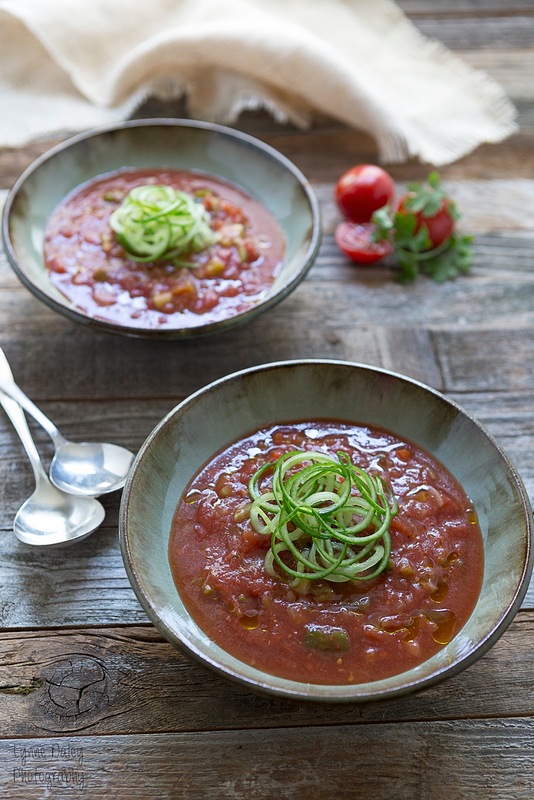 Gazpacho is like a vegetable garden in a bowl. Chocked full of tomatoes, red or green peppers, cucumbers, jalapeños, onions and garlic, this cold soup can be garnished the homemade garlic croutons and cilantro as in the top image or strands of spiralized cucumbers. It’s a perfect make ahead vegetarian first course and would be fabulous with grilled dishes. Today, gazpacho can be made with almost any fruit or vegetable making it one of the most colorful soups. 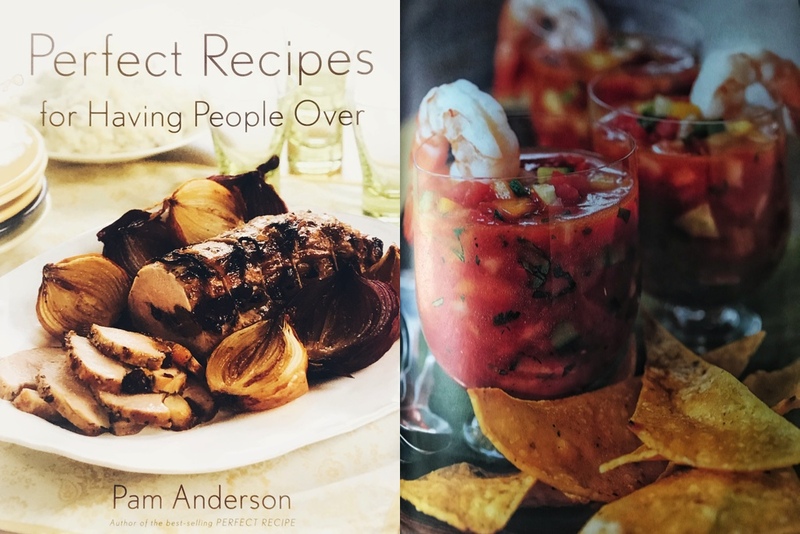 This recipe from Pam Anderson’s Perfect Recipes for Having People Over, not only has the requisite tomato variation, but three-one with pineapple, one with mango and a watermelon one. 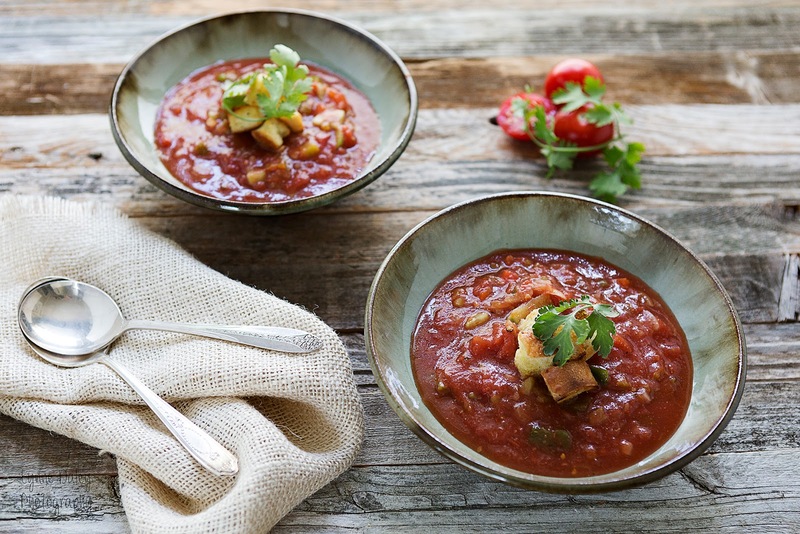 This variation of gazpacho uses tinned petite diced tomatoes which unlike fresh tomatoes are unaffected by refrigeration. My only substitution to the original recipe is a jar of mild salsa for one of the tins of tomatoes. Combine first three ingredients in a food processor or blender and process until smooth. Transfer to a medium bowl and add remaining ingredients. Stir to mix. Cover and refrigerate until ready to serve. The soup keeps well for a few days. Make as directed, but substitute 2 cups fresh pineapple, diced small and 2 cups pineapple juice for eat tomatoes and water. Substitute 3 tablespoons lime juice for the sherry vinegar. For color, a red pepper is nice. Make as directed, but substitute 2 cups watermelon, seeded and diced and 2 cups orange juice for the tomatoes and water. Substitute 3 tablespoons lime juice for the sherry vinegar. Make as directed, but substitute 2 cups fresh mango, diced small and 2 cups orange juice for the tomatoes and water. Substitute 3 tablespoons lime juice for the sherry vinegar. For color, a red pepper is nice. The host for this edition of Menu Lib (e) ro is Sabrina, English translation. Thanks to Marta and Aiu for bringing this collections of menus together. Grazie per questo gazpacho! Ottimo piatto vegetariano e sono contenta delle varianti alla frutta che ci hai regalato!